NexThought Monday – 7 Trends Shaping Africa’s Youth Employment Challenge: What do social entrepreneurs bring to the conversation? In 2001, Charles Maisel started a social enterprise because he saw potential in the young men who sit on the roadside in South Africa’s townships waiting to be hired for a day’s labor. He then flipped the problem into a solution. Charles understood the barriers: the short-term and unreliable nature of employment in the informal economy, lack of trust between the community of employers and young men seeking employment and the difficulty of matching skilled labor to opportunities. Through Men on the Side of the Road (MSR), Maisel helps men find a way into the mainstream economy and long-term employment by setting up an ecosystem that can support them while providing a platform easy for employers to hire qualified and vetted workers that can provide references. The young men are allowed to establish credibility using their MSR ID card, which points to a database that includes references and skills assessment results. MSR has built partnerships with a network of employers such as homeowners, building contractors, landscapers, events management companies, hardware companies and others. By understanding the barriers, Charles has put entrepreneurial power back into the hands of the young men with whom he works. In the 12 years since Charles founded MSR there has been a wide range of new innovations trying to solve the employment issue including Future Forward Ashoka Fellow Fredrick Ouko. Half a continent away, Fredrick Ouko is creating a barrier-free and equal opportunity society for youth with disabilities in Kenya, and in doing so, he is unlocking their previously untapped potential. His organization, the Action Network for the Disabled (ANDY), works to remove unfounded fears and discrimination towards people with disabilities both inside and outside the formal workplace. It does this by first systematically assisting companies to hire youth and adjust their processes, policies and culture into more inclusive ones and by helping youth with disabilities shed their self-victimizing attitudes and develop the skills and confidence they need to become active agents of change in their lives and communities. ANDY prepares youth with disabilities to play an active role in reshaping the leadership structure of Kenya and, thus, promote inclusiveness at a policy level through civic engagement. Fredrick’s intervention takes the hurdles of inequality, insufficient matching between skills and opportunities and the role confusion within sectors for addressing employment challenges and transforms them into a cohesive and holistic solution. These two social entrepreneurs teach a great lesson when it comes to a grand challenge like youth unemployment in Africa. That is, the biggest opportunities for all sectors and institutions are at the center of the problems and the insights within the community. It is not easy to be young and in the labor market today. In the midst of economic and political flux, youth face a lot of uncertainty about their future. According to the International Labour Organization (ILO), global unemployment is reaching crisis levels at 12.6 percent. But recent projections from the UN Population Division tell a significant story: the demographic future of the world will be Africa-driven. Currently, 70 percent of Africans are under the age of 30. By 2040, 50 percent of the world’s youth will be African, most of whom will be women and girls. With nearly half of the youth population in Africa currently unemployed or inactive — and 72 percent living on less than $2 per day—communities are finding it more urgent than ever to enable new avenues and solutions for the creation of quality jobs that make way for youth livelihoods and productivity. How these communities address this challenge could shape the future of the world in unprecedented ways. What are the solutions and trends for the youth employment challenge in sub-Saharan Africa? 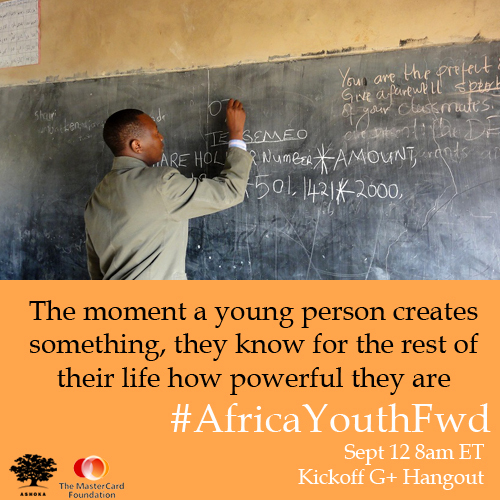 Ashoka has partnered with The MasterCard Foundation for ‘Future Forward,’ an initiative identifying the most innovative social entrepreneurs addressing the youth employment crisis and convening thought leaders, youth and innovators to discuss insights and best practices about ways forward for Africa’s youth. 1. Education as a “cure-for-all” is a myth: As one of the innovators we interviewed said, “There is this myth that if you simply invest in education, you’ll turn the economy around, but schooling is not enough. You have to arrive with the right mentality—what is the right thinking and attitudes that will promote entrepreneurship and job creation? That’s where it starts.” Our current employment challenges call for a transformation of the traditional rote-memorization education to help young people meet the challenges of our fast-paced times. To do that, youth have to cultivate and exercise the skills of the future that help them create solutions for complex problems while in turn bringing value to the labor market and creating a demand for their skills. These skills for the future are: leadership (courage and confidence as initiators), hands-on problem-solving (creativity, agency for changemaking and critical thinking), teamwork, and the fundamental skill of empathy. Empathy allows for a worldview rooted in understanding the perspectives and circumstances of others. 2. “Traditional” forms of employment are being replaced due to rapid market and opportunity shifts: As South African Prime Minister Trevor Manuel put it, “Traditional forms of employment are disappearing, especially in the agricultural and mining sectors.” While whole industries are being swallowed by internet-enabled giants including Amazon in the West, vast changes are also afoot within Africa. Traditional jobs are being replaced within increasingly urban, mobile-enabled and consumer-based economies, which “leapfrog” with 21st century technology. Youth need to be prepared to redefine “jobs” based on shifting opportunities and continue to adapt to bridge the skills-opportunity gap. 3. Population growth and social inequality can be hurdles: In sub-Saharan Africa, 10-12 million new workers seek employment every year. This means a growing number of youth will rely on rapid growth in economies for new jobs. Even though six of the fastest growing countries in the world are in Africa, broad-spanning inequality and corruption stand in the way of access to jobs and employment. 4. The informal sector is a source of “unsustainable opportunity”: In many countries across Africa, the largest burden of employment falls on informal streams. In Kenya, 77 percent of the population relies on the informal sector for their livelihood. Unfortunately, while a job in the informal sector is better than no job at all, it can limit long-term productivity per worker as well as possibilities for quality sustainable employment and an escape from the cycle of poverty. 5. Rural and urban strategies present different challenges: Africa currently has the world’s smallest population of urban residents. Compared to 14 percent living in urban areas in 1950, by 2015, 45 percent of people in sub-Saharan Africa will live in urban areas. This means that employment interventions have to take these changes into account and be mindful to include rural areas with smaller economies of scale and access to markets—as well as consider the unique challenges behind urban employment and the potential for youth exploitation in cities. 6. Public, business and citizen-sector organizations have a role to play: African governments and international organizations increasingly recognize youth issues as key to Africa’s development. In an address to the International Labor Conference in Geneva this past June, the chairperson of the African Union Commission, Nkosazana Clarice Dlamini-Zuma, said, “We are determined to step up our efforts to promote job creation, work for the eradication of poverty, achieve growth and allow equitable distribution, particularly for women and the youth.” Countries are moving toward broad-sweeping policy commitments to increase job creation. Nigeria has created a special fund to provide grants of up to $70,000 to young entrepreneurs. At the same time, large corporations are starting to partner with local businesses and NGOs to develop training and entrepreneurship initiatives to improve the employability of youth. All this is encouraging; however, job creation is an overwhelming social challenge that seems to be the responsibility of “everyone and anyone”: the public, private, citizen sectors and schools. This causes role confusion and a need to share insights across sectors. All of these sectors have much to learn from each other and particularly from the community-based social innovators who are accountable to the people and working across sectors to provide holistic solutions. 7. Unemployment frustration leads to instability: In the face of chronic unemployment, youth can feel disempowered, frustrated and disoriented. This has key implications for political, social and economic instability in the region as can be evidenced by the global increase in protests in the past decade, many fueled by youth frustration and unemployment. What do social entrepreneurs bring to this conversation? It is impossible to discuss youth unemployment without considering the multi-sector and country-specific nature of the issue. The good news: there are many rarely told stories of community-rooted innovators, social entrepreneurs with a long history of working to help communities become “unstuck” and help youth become changemakers. These innovators build solutions based on a deep understanding of the socio-economic context within their specific communities. They weave initiatives that flip problems into cross-sector, sustainable, community-driven solutions. As system thinkers, they foresee trends like an unstable informal sector, unequal and biased access to economic opportunities and a lack of coordination between sectors. They create solutions out of those very building blocks. Social entrepreneurs are also expert organizers and nurturers of changemakers, empowering the community itself to help shape and create positive change. Throughout the Future Forward initiative, we will explore stories like those of the social entrepreneurs at the begging of this post. They exemplify how social innovators flip problems and empower changemakers in their communities to address the youth employment crisis in Africa. Just released this week in the special edition of the MIT Innovations Journal: “Future Forward: Innovations for Youth Employment in Africa” article by Beverly Schwartz, Ashoka VP, Author of Rippling: How Social Entrepreneurs Spread Innovation Throughout the World and Deepali Khanna, Director of Youth Learning at The MasterCard Foundation. Also just released: “Generation Entrepreneur? The State of Global Entrepreneurship.” by a panelist for the #AfricaYouthFwd webinar series: Mike Herrington, Executive Director, Global Entrepreneurship Monitor Worldwide (GEM). Update from the kick-off #AfricaYouthFwd G+ Hangout at the 2013 Global Youth Economic Opportunities Conference in Washington, D.C: Watch a conversation between youth panelist Kabelo Ramatlhape and Beverly Schwartz. Kabelo is a student of the Maharishi Institute founded by another Future Forward Ashoka Fellow Dr. Taddy Bletcher. The tuition free Institute empowers youth to be entrepreneurial changemakers by improving their self-awareness, confidence, skills and employability through school activities. Tsega Belachew is the Global Digital Media Strategist for Ashoka’s Changemakers.